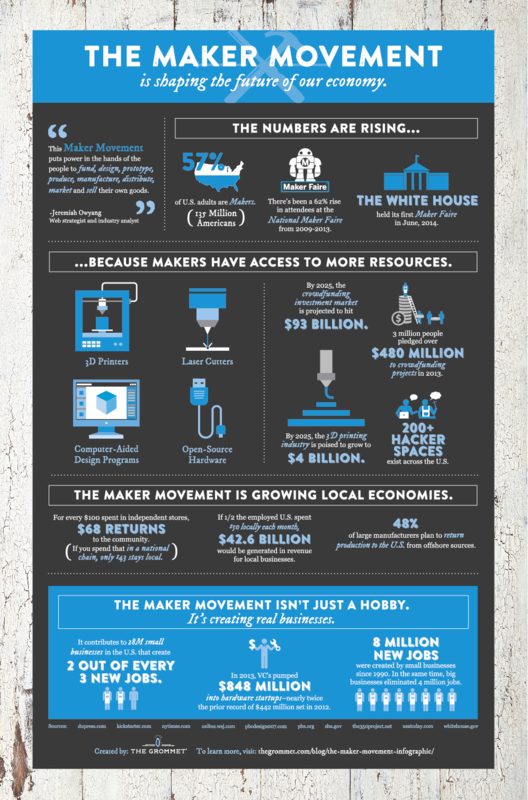 So it goes with the Maker Economy – otherwise referred to as the Maker Movement. According to Industry Analyst Jeremiah Owyang, the Maker Movement puts power in the hands of people to fund, design, prototype, produce, manufacture, distribute, market, and sell their own goods. According to youth market research firm Ypulse, 69% of millennials wish they could create a new product, and 81% would be interested in helping a company design one. This shift in production also shifts power from large, capital intensive enterprises to individual prosumers. As the focus on a next economy increases, so does the likelihood that it is driven by networks of prosumers versus large corporations. This movement is not a future movement. According to the Infographic below, 135 million makers in America are already growing local economies and creating new jobs – contributing 18 million small businesses in the U.S. and accounting for two out of every three new jobs. When viewed through the lens of 3D Printing Forecasts, the future looks bright as well. One such forecast has the 3D Printing Industry becoming a $16 billion global industry within the next five years, with a 45.7 CAGR. It is also reviving the hardware sector, as VCs pumped $848 million into hardware start-ups in 2013 – nearly twice the prior record of $442 million set in 2012. As a result of this movement, millions of workers are supporting themselves by starting micro-businesses and Redefining Entrepreneurship in the process. The micro-business sector is typically defined as businesses that employ fewer than five people and require little start-up capital. This trend describes larger shifts in the economy, most notably the recent dramatic increase in flexible work, peer-to-peer businesses, and a declining middle class – which has shrunk to an all-time low according to a September 2012 U.S. Census report. Etsy – a marketplace where people around the world connect to buy and sell unique goods – reflects these growing trends. Just 26% of Etsy sellers are full-time employees, while 48% are independent, part time, or temporary workers. These sellers combine income from traditional jobs and their Etsy efforts to make a living. As the middle class continues to decline, the Maker Economy represents new opportunities to bolster it through micro-businesses. This disruptive scenario is driven by several market dynamics. According to a recent article on the big changes driving the Maker Movement, new products and services that capture the public’s imagination can become overnight successes. By unlocking the means of production, the emerging environment allows individual makers to compete and succeed against traditional companies. Access to this environment allows ideas to become tangible, enabling large portions of society to manifest them. The notion of creativity becoming tangible is a powerful one. As possibilities are seen and touched, it helps to envision the art of the possible. This more physical method of thinking and communicating ideas has the potential to spur innovation to exciting new heights – but it also challenges the traditional company to keep pace. Like every disruptive scenario assessed through this recent Blog series, there are massive implications that drive the need to analyze the scenario and formulate a set of responses. The Maker Economy is one of several disruptive scenarios in our line of sight. An additional challenge becomes very apparent when you look across this growing set of disruptive scenarios – they impact each other. This will force companies to view relevant disruptive scenarios holistically, while effectively connecting the dots between scenarios. For example, the Smart City scenario intersects with the maker movement to create a differentiated environment that attracts talent. One of my key learnings through analysis and executive dialog is that scenario analysis takes too narrow a focus. The broad implications of a particular scenario are underestimated, limited in part by our traditional views of an industry or business. As discussed in the past, all boundaries are blurring, as the reach of each scenario is broadening. Risk and opportunity are therefore missed if the lens is not wide enough. Let’s look at possible broad implications of the Maker Economy across multiple industries. If you shoot somebody with a 3D plastic gun, who is responsible? The designer? The maker of the printer? The material supplier? The consumer who makes the gun? Will a building made with 3D-printed parts be as durable as a structure built by conventional means? Will it comply with municipal building codes and safety regulations? Commercial food production companies see an increased liability risk, driven by the ability to use new and untested food processing methods. Materials used during the processing of 3D-printed food, such as printer plastics or metals, could potentially seep into the food and cause unforeseen health risks and exposures. The number of complaints about the substitution, tampering, or misrepresentation of food or food packaging (food fraud) for economic gain, may also evolve with respect to 3D-printed food. These are just a handful of potential responses gleaned from executive dialog and the various sources referenced in this post. The Maker Economy as a disruptive scenario is very disruptive – but when it intersects with other disruptive scenarios, the impact takes on a multiplicative affect. To reiterate, it does not suffice to view these disruptive scenarios in isolation. Much like the combination of digital forces is increasing the pace of innovation, so too will these disruptive scenarios combine to accelerate disruption. As if the challenge wasn’t onerous enough, the combinatorial nature of our current environment complicates things further. That wraps up this look at the Maker Economy. Extremely promising future for all things 3D printing– those who chalked the buzz up to a fad mentality will be eating their words for the next 3 to 5 years.